Australian Perth Mint Gold. Gold Bars & Rounds. Perth Mint Gold Bars. America the Beautiful Coins. 90% & 40% US Silver Coins. Australian Perth Mint Silver. Cast & Hand Poured. 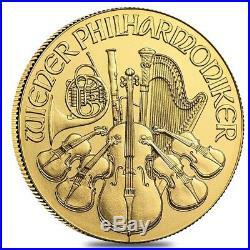 1/4 oz Austrian Gold Philharmonic Coin (Random Year). This Austrian gold coin is one quarter of a troy ounce of. 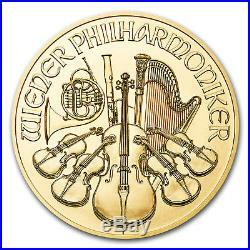 Gold Philharmonic coins date back to 1989 and are sought after all over the world. On the front of these coins there is a picture of the Great Organ of the Golden Hall from Musikverein, Vienna’s concert hall, along with the year, weight, and purity of the coin. On the back you can see a variety of instruments. The diameter of the coin is 22 mm and the thickness is 1.2 mm. This coin has a face value of. 25 Euros, making it great for both collectors and investors all around the world. Year of the coin varies on our current inventory and is completely random. Like all of our other gold coins, this one is guaranteed to be 100% authentic. By purchasing from Bullion Exchanges, you are agreeing to all of our Terms and Policies. Bullion Exchanges reserves the right to refuse or cancel any order reviewed by our Compliance Team, which are deemed questionable or have increasing potential risk for being fraudulent. All customers are subject to a review at our own discretion, in which additional information, identification and/or documentation, may be requested. A prompt response would help expedite the fulfillment of your order. Packages are no longer insured if the tracking information shows the package is delivered. We will only be liable to cover packages that are lost in transit or damaged. There are no exceptions to this policy. Once an order is placed, it cannot be modified or cancelled. Using high definition digital video, we record the packing of our products to affirm accuracy. Bullion Exchanges reserves the right to refuse or cancel any order reviewed by our Compliance Team, which are deemed questionable or have potential risk for being fraudulent. There are no exceptions. The submission of an order and subsequent receipt of a confirmation locks in your order and affects our metal hedging requirements and thus we are unable to make any price adjustments. Our in-house numismatist staff assign conditions to all products. The condition assigned to the products is derived from industry-wide standards. Please keep in mind that most images are stock images, and therefore you should not expect to receive the pictured products. Silver products, and some gold as well, may exhibit milk spots, and/or toning, which are normal and do not change the condition described in the listing, nor the value of the product. Coins that are holdered by one of the major grading companies are graded based on the condition they were in at the time of grading. However, at times, coins do tend to develop spotting or toning which are a normal happenstance in coins. Please keep in mind, the appearance of the toning and/or milk spots does not mean that the coin is not the grade specified on the actual slab. In instances where there is a discrepancy where the customer believes to be unjust, please refer to the grading companys guarantee policy. Both NGC and PCGS have a program where they will compensate the owner of the current coin if they believe the coin deserves a lower grade than it had originally received. Please note, bullion coins, bars and rounds are mass-produced and are not struck to the same quality standards as collector coins. These bullion products are not certified and therefore will not always be 100% perfect. All sales are final and therefore in cases when a product is offered on a Deal Price, previously locked-in orders for that product will not be subject to price reductions or cancellations. Bullion Exchanges reserves the right to cancel sales that may or may not have typography issues within the listings, pricing inaccuracies, systematic faults by our system, and/or errors caused by eBays system, without further notice. Purchasing bullion and/or coins involves price risk, and the purchaser assumes all such risk. We do not offer or make price adjustments based on the market fluctuations of precious metals, or for any other reason. We will never ask the customer to pay more for a product if the price significantly increased, so please refrain from requesting price adjustments after market prices decrease. 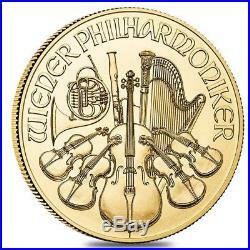 The item “1/4 oz Austrian Gold Philharmonic Coin (Random Year)” is in sale since Thursday, December 28, 2017. This item is in the category “Coins & Paper Money\Bullion\Gold\Coins”. The seller is “bullion.exchanges” and is located in New York, New York. This item can be shipped to United States. This entry was posted in austrian and tagged austrian, coin, gold, philharmonic, random, year. Australian Perth Mint Gold. Gold Bars & Rounds. Perth Mint Gold Bars. America the Beautiful Coins. 90% & 40% US Silver Coins. Australian Perth Mint Silver. Cast & Hand Poured. 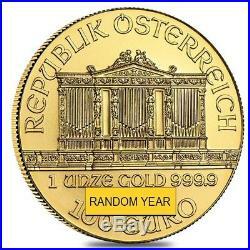 1 oz Austrian Gold Philharmonic Coin (Random Year). This Austrian gold coin is one troy ounce of. Gold Philharmonic coins date back to 1989 and are sought after all over the world. The obverse of these coins features the Great Organ of the Golden Hall from Musikverein, Vienna’s concert hall, along with the year, weight, and purity of the coin. The reverse features a variety of instruments. The diameter of the coin is 37 mm and the thickness is 2 mm. This coin has a face value of 100 Euros making it great for both collectors and investors all around the world. Year of the coin varies on our current inventory and is completely random. Like all of our other gold coins, this one is guaranteed to be 100% authentic. By purchasing from Bullion Exchanges, you are agreeing to all of our Terms and Policies. Bullion Exchanges reserves the right to refuse or cancel any order reviewed by our Compliance Team, which are deemed questionable or have increasing potential risk for being fraudulent. All customers are subject to a review at our own discretion, in which additional information, identification and/or documentation, may be requested. A prompt response would help expedite the fulfillment of your order. Packages are no longer insured if the tracking information shows the package is delivered. We will only be liable to cover packages that are lost in transit or damaged. There are no exceptions to this policy. Once an order is placed, it cannot be modified or cancelled. Using high definition digital video, we record the packing of our products to affirm accuracy. Bullion Exchanges reserves the right to refuse or cancel any order reviewed by our Compliance Team, which are deemed questionable or have potential risk for being fraudulent. There are no exceptions. The submission of an order and subsequent receipt of a confirmation locks in your order and affects our metal hedging requirements and thus we are unable to make any price adjustments. Our in-house numismatist staff assign conditions to all products. The condition assigned to the products is derived from industry-wide standards. Please keep in mind that most images are stock images, and therefore you should not expect to receive the pictured products. Silver products, and some gold as well, may exhibit milk spots, and/or toning, which are normal and do not change the condition described in the listing, nor the value of the product. Coins that are holdered by one of the major grading companies are graded based on the condition they were in at the time of grading. However, at times, coins do tend to develop spotting or toning which are a normal happenstance in coins. Please keep in mind, the appearance of the toning and/or milk spots does not mean that the coin is not the grade specified on the actual slab. In instances where there is a discrepancy where the customer believes to be unjust, please refer to the grading companys guarantee policy. Both NGC and PCGS have a program where they will compensate the owner of the current coin if they believe the coin deserves a lower grade than it had originally received. Please note, bullion coins, bars and rounds are mass-produced and are not struck to the same quality standards as collector coins. These bullion products are not certified and therefore will not always be 100% perfect. All sales are final and therefore in cases when a product is offered on a Deal Price, previously locked-in orders for that product will not be subject to price reductions or cancellations. Bullion Exchanges reserves the right to cancel sales that may or may not have typography issues within the listings, pricing inaccuracies, systematic faults by our system, and/or errors caused by eBays system, without further notice. Purchasing bullion and/or coins involves price risk, and the purchaser assumes all such risk. We do not offer or make price adjustments based on the market fluctuations of precious metals, or for any other reason. We will never ask the customer to pay more for a product if the price significantly increased, so please refrain from requesting price adjustments after market prices decrease. 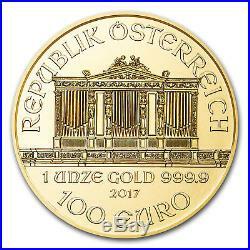 The item “1 oz Austrian Gold Philharmonic Coin (Random Year)” is in sale since Friday, November 10, 2017. This item is in the category “Coins & Paper Money\Bullion\Gold\Coins”. The seller is “bullion.exchanges” and is located in New York, New York. This item can be shipped to United States. 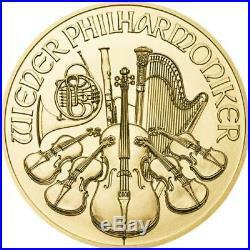 Gold Austrian Philharmonic 1 oz. Each coin is 1 troy oz. Date of our Choice as the Dealer. 1 – Gold 1 oz. Philharmonic coin – Date of Dealer Choice. 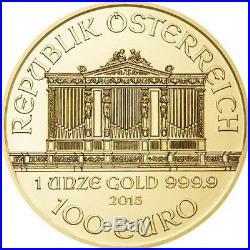 Customers will receive 1 Gold Austrian Philharmonic 1 oz. Each coin is taken from a Mint tube. We do not search the coins. Coins are sometimes perfect and sometimes have small dings, scratches or spots. The Austrian mint has been producing innovative coins and currency for over 800 years, making it one of the oldest continuously producing minting institutions in the world. The Mint began producing the Gold Vienna Philharmonic coin in 1990. The gold Vienna Philharmonic coin is the only European. 9999 circulated gold coin produced on a large scale. It is also the only coin backed and insured by the Euro. At a fineness of. 9999 or 24 karats, the Gold Vienna Philharmonics demonstrates the level of purity, and perfection, that the Austrian Mint demands for its investors. This coins is one of the most internationally sought after coins available today. Each of the Vienna Philharmonic coins features imagery paying homage to the cultural pride of Austria, the Vienna Philharmonic Orchestra. UPS will attempt 3 Deliveries at the location. UPS Ground with Signature Confirmation. 32932 Pacific Coast Hwy. #14-234, Dana Point, CA 92629. Hours – Nights & Weekends. We try our best to reach each customer in a timely manner. 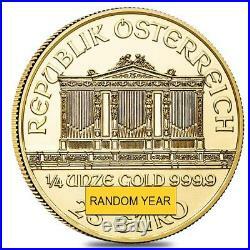 The item “1 oz Austrian Philharmonic Gold Random Year 1 oz. 9999 fine Gold Coin $100 Euro” is in sale since Monday, May 7, 2018. This item is in the category “Coins & Paper Money\Bullion\Gold\Coins”. The seller is “d.b.s.coins” and is located in Dana Point, CA. This item can be shipped to United States. This entry was posted in austrian and tagged austrian, coin, euro, fine, gold, philharmonic, random, year. America the Beautiful Coins. New Zealand Silver Coins. Add JM Bullion to your favorite stores and receive our exclusive emails about new items and special promotions! 1 oz Austrian Gold Philharmonic Coin (Varied Year). The most popular coin series from the European continent is the Austrian Philharmonic. Introduced in 1989, today the Austrian Philharmonic coin program includes a gold, silver, and platinum version from the Austrian Mint. It is, however, the Austrian Gold Philharmonic coin that anchors the series and was the original offering in the program. Right now, the 1 oz Austrian Gold Philharmonic Coin is available from varied years of issue from JM Bullion. Arrives in a protective plastic flip or tube for quantities of 10. Official gold bullion coin of Austria. Contains 1 Troy oz of. Bears a face value of 2,000 Austrian Schillings (ATS) or &###x20AC;100 (Euros). Obverse features the image of the Musikverein Pipe Organ from the Golden Music Hall. Reverse includes the design of a cornucopia of instruments from the members of the orchestra. Available in mintage years from 1989 to 2016. JM Bullion is one of the nation&###x2019;s leading online precious metals dealers, serving hundreds of thousands of customers since the company&###x2019;s inception in 2011. Operating as a lean online retailer, we are able to offer the lowest possible pricing on the most popular gold, silver, and platinum bullion items. Our labels, return address, and packaging do not give any indication of the valuable contents of the package, so you can rest assured that your packages will arrive safe and sound. When ordering from JM Bullion, you can be sure that your products are fully covered from our doorstep to yours. Is my financial and personal information secure? Yes, all personal information is transmitted using secure SSL web pages. These pages are encrypted to ensure that no personal, financial, or identifiable information is made available to anyone other than you, your bank, or the processor. Please note that even if you don? Will gold and silver go up in value? We cannot guarantee that gold or silver will go up in value. Like any investment, gold and silver can and will both increase and decrease over time. While we cannot guarantee that gold or silver will increase in value, history has proven its long term viability as an investment vehicle. How are your prices determined? Our prices are determined by the spot prices of gold and silver, in addition to our fixed premiums for each product. Our spot prices, provided by Xignite. Com, are accurate up to the second, and we add on our premium per ounce for each product to come up with the final price. T need to worry about items going out of stock or disappearing during a price update. Do you have minimum or maximum order sizes? Can I modify my order? Unfortunately order modifications require tremendous effort on our part, as our system is largely automated. Can I cancel my order? We begin to process your order as soon as it is completed, so unfortunately we cannot permit order cancelations. Attempting to do so typically results in pick and pack or billing errors, so we do not allow order cancelations. When will I receive my order? From there, the transit time depends on the carrier. Customers receive tracking numbers as soon as their orders queue up for pick and pack, so they can track their order from the time it leaves our facility until it arrives to their doorstep. Can you combine separate orders? What happens if my order is lost or damaged in transit? View more great items. This listing is currently undergoing maintenance, we apologise for any inconvenience caused. The item “1 oz Austrian Gold Philharmonic Coin (Varied Year)” is in sale since Monday, August 7, 2017. This item is in the category “Coins & Paper Money\Bullion\Gold\Coins”. The seller is “jmbullion” and is located in Las Vegas, Nevada. This item can be shipped to United States. 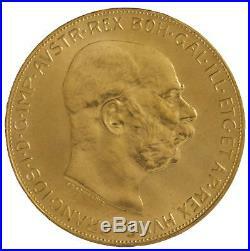 This entry was posted in austrian and tagged austrian, coin, gold, philharmonic, varied, year. 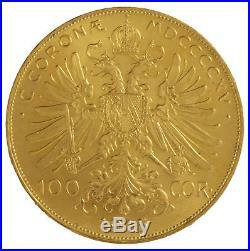 Austrian 100 Corona Gold Coin – Random Year. The Austrian 100 Corona gold coin is a beautiful gold coin that displays the Austrian King Franz Josef I on the obverse. The reverse shows the Austrian Coat of Arms directly in front of a crowned imperial double-headed eagle. Each coin will be packaged individually in plastic flips. 98 fine troy oz. Diameter (mm): 1.45. With its foundations laid by Richard the Lionheart’s ransom to Duke Leopold V in 1194, the Austrian Mint has a long standing history of producing highly recognizable coins. Located in Heumarkt, central Vienna, since the first half of the 19th century, the Austrian Mint combines centuries of experience in artistry and minting to create world renowned products. Boxes or APO/FPO at this time. Please note that with our dynamically priced items the spot price will be updated at a minimum every 10 minutes. Items in your shopping cart are subject to change in accordance with the spot price. Bay Precious Metals, Inc. Is a trusted supplier of gold, silver, platinum, and palladium. We pride ourselves in providing the ultimate customer experience. From inspecting each product to ensure it meets our strict quality guidelines, having consistently low and transparent pricing, we are always working with. Our close relationship with various mints around the world allows us to have the core products that you have come to know and love. Our dedication to our customers, both new and established, is what differentiates us. We are committed to delivering you the highest quality product, securely, and within our promised time frame. And we will respond within 24-48 hours. View more great items. This listing is currently undergoing maintenance, we apologise for any inconvenience caused. The item “Austrian 100 Corona Gold Coin Random Year” is in sale since Tuesday, February 09, 2016. This item is in the category “Coins & Paper Money\Bullion\Gold\Coins”. The seller is “baypreciousmetals” and is located in USA. This item can be shipped to United States. This entry was posted in austrian and tagged austrian, coin, corona, gold, random, year.